Could containers dethrone virtual machines as the next generation compute architecture? I’ve heard many industry folks say that containers are moving faster into real deployments than almost any previous technology, driven by application developers, DevOps and business-side folks looking for agility as much as IT needs efficiency and scale. 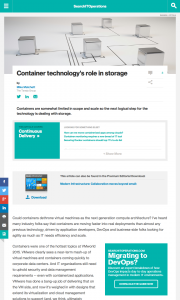 Containers were one of the hottest topics at VMworld 2015. VMware clearly sees a near-term mash-up of virtual machines and containers coming quickly to corporate data centers. And IT organizations still need to uphold security and data management requirements — even with containerized applications. VMware has done a bang-up job of delivering that on the VM side, and now it’s weighed in with designs that extend its virtualization and cloud management solutions to support (and, we think, ultimately assimilate) enterprise containerization projects. VMware’s new vSphere Integrated Containers (VICs) make managing and securing containers, which in this case are running nested in virtual machines (called “virtual container hosts”), pretty much the same as managing and securing traditional VMs. The VICs show up in VMware management tools as first-class IT managed objects equivalent to VMs, and inherit much of what of vSphere offers to virtual machine management, including robust security. This makes container adoption something every VMware customer can simply slide into. However, here at Taneja Group we think the real turning point for container adoption will be when containers move beyond being simply stateless compute engines and deal directly with persistent data.